“Mr. Ranhofer is a big, good-natured Frenchman, who is very reticent over his success as a master of gastronomy…His office is so situated in the center of Delmonico’s kitchen that he can reach any part of his domain at a moment’s notice. To the left is the ice cream and pastry section. To the right the experts in meat, poultry, and fish have their departments. In the center the supplies for immediate use are stored, and along the opposite end is a row of ovens and ranges. The forty odd cooks under Mr. Ranhofer are as perfectly trained and drilled as a regiment of soldiers. They are formed into companies under the supervision of assistant chefs, who are responsible to Mr. Ranhofer for everything that comes within their departments. Four cooks rule over the roasting ovens, and eight men in the meat department devote their time to preparing the meats for the four roasters. Four men are responsible for the vegetables and fried dishes. Pastry in its various forms is in the hands of four experts. Three men make the ice cream. Two men make confections and cakes alone. Bread making is an art in itself, in charge of three bakers. Eight men are kept in reserve to clean up things and assist generally, and ten women and two men are occupied in washing pots and kettles and cleaning dishes. Over all the force Mr. Ranhofer keeps his eyes. He is familiar with the specialty of each of his cooks. He can give a scullery man points on scrubbing a soiled pot as well as tell the man in the meat or in the roasting department how to prepare a canvasback duck; he can judge an undercrust with the same certainty that he can bon bons, mottoes, or odd confections. 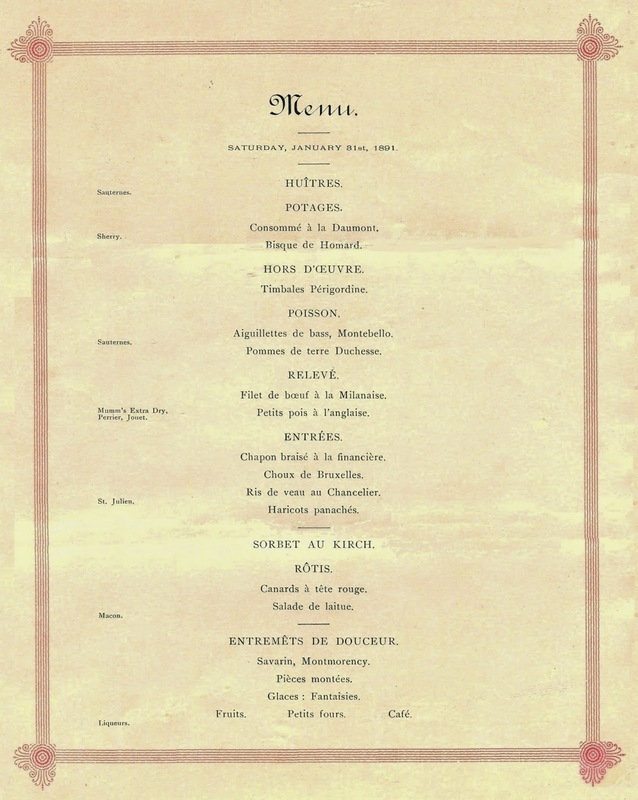 “When the dinner hour arrives the machinery of the service is set in motion by Mr. Ranhofer in the kitchen and by Eugene Garnier, the maitre d’hotel, in the banquet room. The head waiter looks for a glance from the matre d’hotel. Thirty waiters, one for every ten persons, stand silently by, expecting a look from the head waiter. The manager says ‘all right’ to the head waiter, the head waiter waves his hand at the waiters, and the thirty men go to their assigned places at the tables. The head waiter has divided the men under him into squads of six or ten, and has given the best waiter in each squad instructions to keep a watchful eye over the more inexperienced men. The matre d’hotel communicates through a speaking tube with the chef. “In the kitchen the forty cooks stand silently in their various departments. They are not permitted to talk more than is absolutely necessary. When the manager has told the chef to go ahead, the cooks in charge of the coppers of soup send up the dumb waiter to the pantry on the banqueting room floor two tureens of soup. The carver, who acts as an intermediary between the cooks and the waiters, stations himself in the pantry. His office is one of the most responsible of all in connection with the banquet. In serving the soup and the other dishes he must use keen judgment, so that all of the diners shall be equally served, and that without waste. The soups are cooked in advance, and kept hot in closed pots immersed in hot water. In making the soup the cooks work on a basis of one quart to four to six persons, although in most restaurants the portions are not so generous. “When the soup has been sent up from the kitchen, down the speaking tube comes one word, ‘Next!’ and the timbales à la Marly are hurried up the stairs. The fish has been prepared in advance of the dinner, and the four frying cooks stand in readiness to take from the warming closets the sole, which is nearly 100 pounds in quantity. When the call of ‘Next!’ comes down the tube again the fish is hurried up to the carver, who apportions the course out to the waiters, with potato croquettes which come from four vegetable cooks. The saddle of venison is called from the four roast cooks, and then the highest ingenuity of the carver is called into play. The sight of him as he slices the huge chunks of venison into portions of equal size with quick and graceful motions would make the most confident Father of a family ashamed to sit at the head of his domestic board. So closely can the skillful carver adapt his material to the number of diners that when the musicians take their share hardly enough meat is left for a two-portion stew. 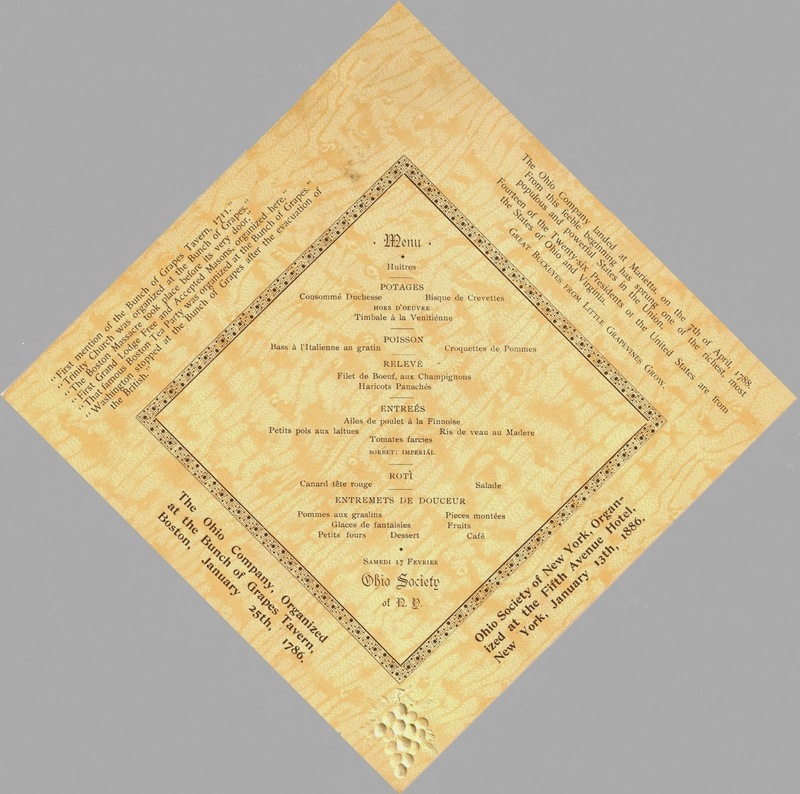 “The entrees are cooked in the order of service. 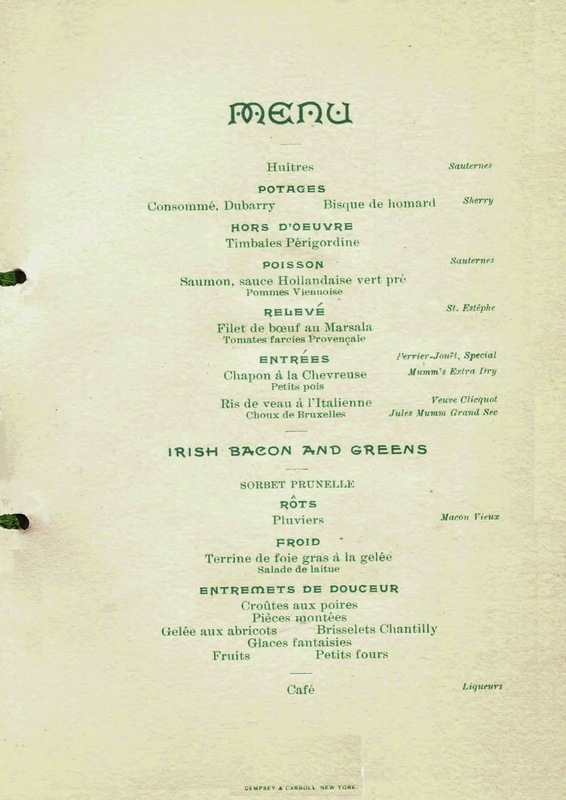 While the banqueters are eating their venison the eight men in the meat department have sent the pullets to the roasting cooks, who make ready the pullet à la Moray for the first entrée. 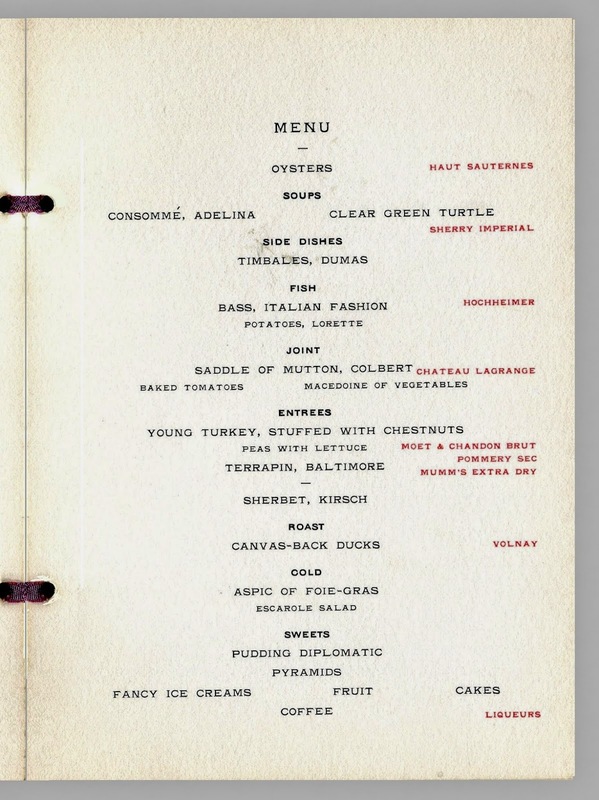 While the pullets are being prepared, the vegetable cooks are frying the artichoke bottoms, the meat cooks are putting on the cutlets, some of the assistants are getting the string beans ready for service, 100 terrapins have been turned over by the men in the meat room to the roasting cooks, and the seven men in the ice cream and pastry sections, who have been comparatively idle up to this point, get the sherbets, hot entremets, and ice cream ready to send up. The canvasback ducks receive the attention they deserve. One word from the matre d’hotel promptly brings each course to the floor above. 1. 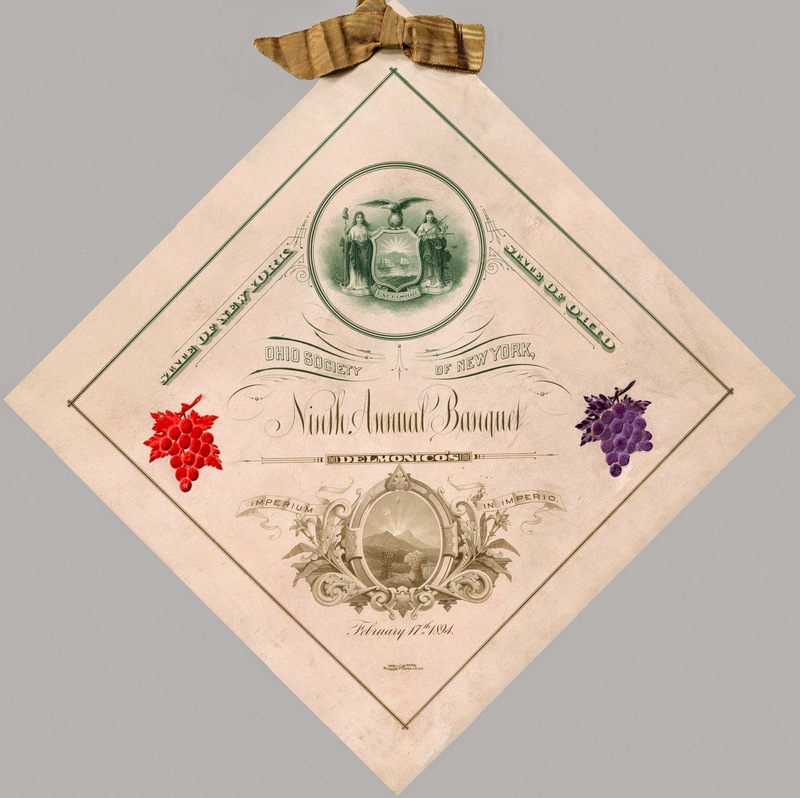 The (New York) Sun, “Serving a Public Dinner,” Sunday, 28 October 1894, Section 2, p. 8. 2. 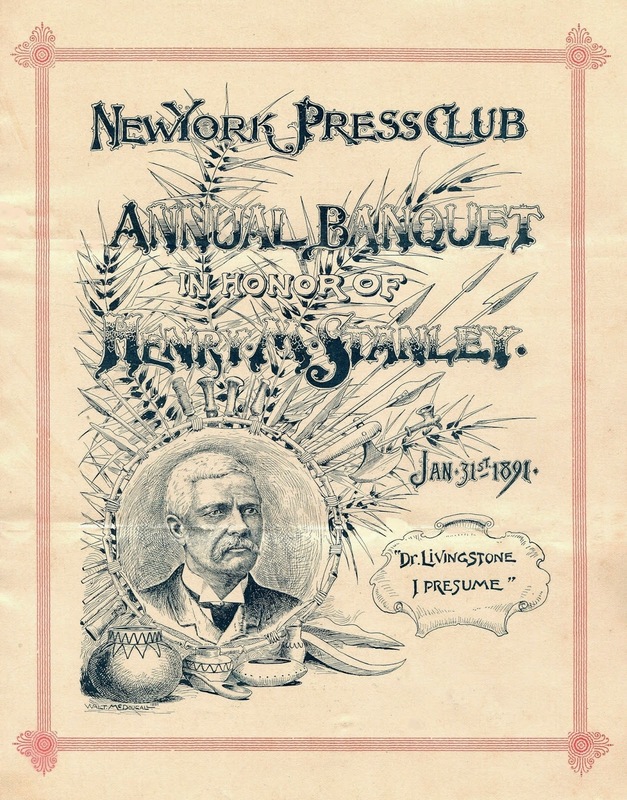 Delmonico’s: New York Press Club Annual Banquet in honor of British journalist and explorer Sir Henry Morton Stanley, 21 January 1891, 8¼ x 10½ in. ; Printed by P. F. McBreen. General William Tecumseh Sherman, one of the speakers, died two weeks after this banquet. 3. 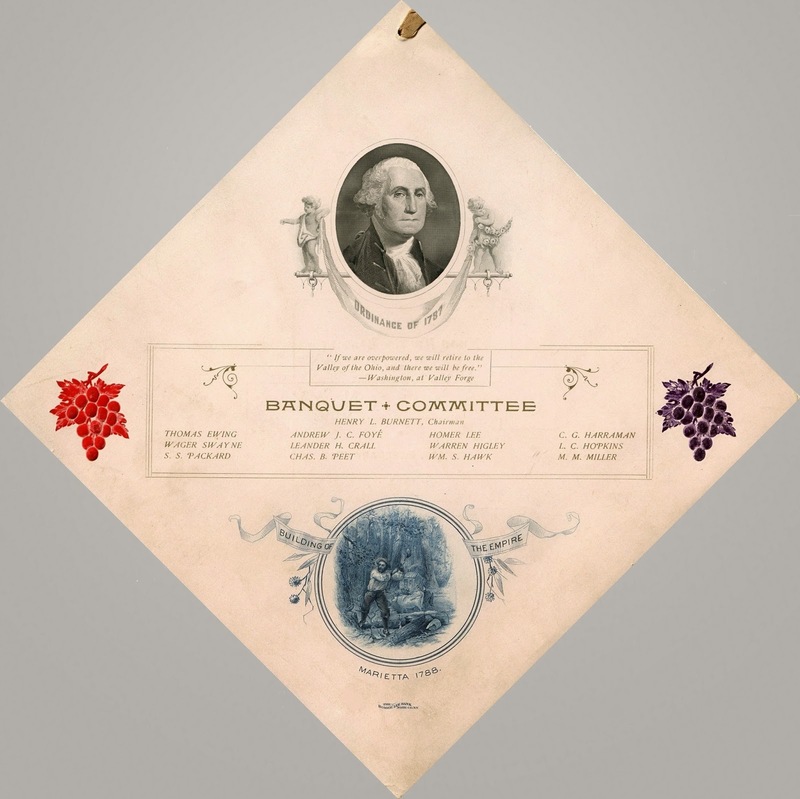 Delmonico’s: Ninth Annual Banquet of the Ohio Society, 17 February 1894, 8 x 8 in., Printed by Homer Lee Bank Note Co.
4. 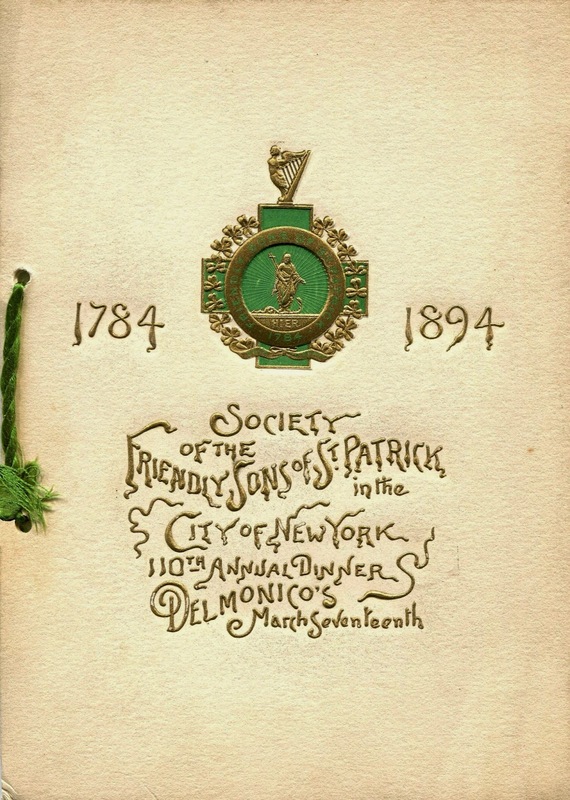 Delmonico’s: 110th Annual Dinner of Society of the Friendly Sons of St. Patrick, 17 March 1894, 5 x 7 in. 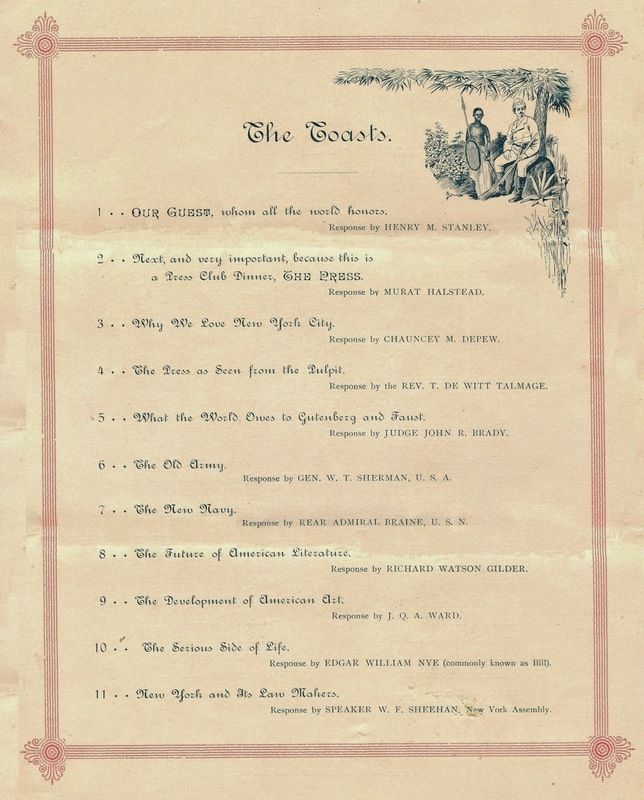 ; Printed by Dempsey & Carroll. 5. 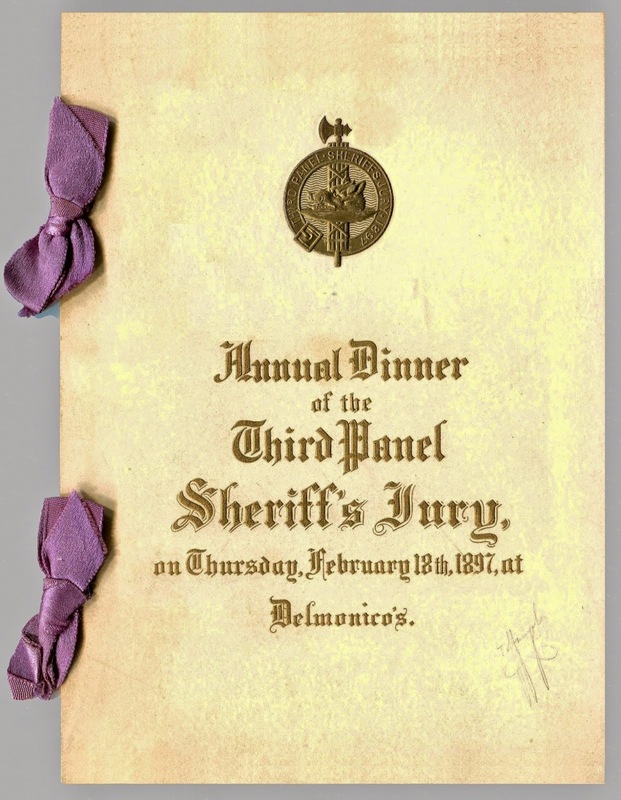 Delmonico’s: Annual Dinner of the Third Panel Sheriff’s Jury, 18 February 1897, 4¾ x 6½ in. ; Printed by Tiffany & Co.